When the alarm went off, Chandler and I leapt out of bed. We were in a hurry to get out of town. We loaded our bikes up before breakfast in case Crazy Lady tried to encourage us to stay another night. As we walked to the restaurant, we noticed “Hotel California” playing on the stereo and couldn’t help our nervous laughter during the “You can check out, but you can never leave” line. In the end, we got a solid breakfast, our passports back and slipped away without any interaction with Crazy Lady. Our entire ride was spent on Highway 1, which means lots of trucks, motos, busses and honking. We don’t normally listen to music while riding, but we made an exception today. So, we put in our headphones, put our heads down and pounded out the miles with few stops and zero photos. At this point, we should admit that Chandler has been doping. With his cough not getting any better, we got him some Salbuteral which is some version of or maybe the same thing as Albuterol, a kind of steroid. Chan is not a fan of taking any drugs usually, but this was some miracle stuff which virtually eliminated his cough by allowing his lungs to operate more normally. He was still pretty sick underneath the drugs at first, but since he was no longer exhausted from constantly coughing, he got better pretty quickly. 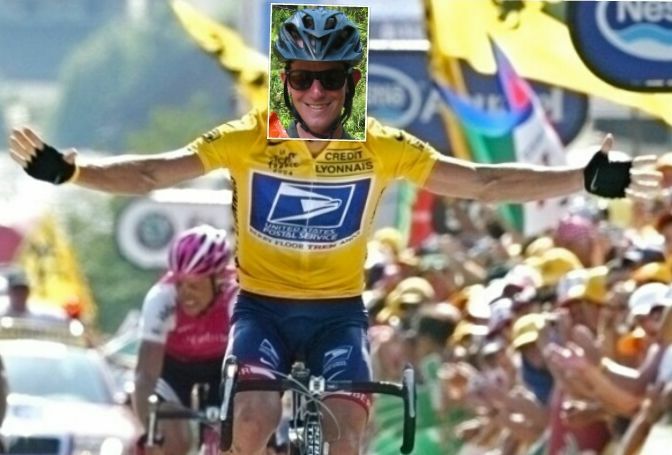 He took the last of his ‘roids on the ride today, and was generally feeling pretty good, despite the less than ideal riding conditions. 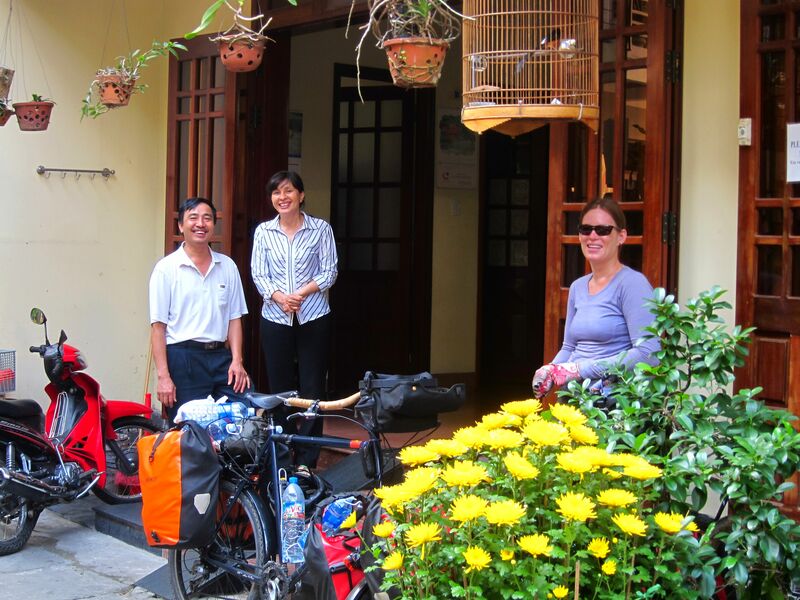 We checked into a small hotel in Hue with the kindest owners. After asking about the price of the room, they insisted we sit down and have a cold drink before looking at the room. The owner’s wife brought us homemade strawberry juice, which was absolutely delicious and refreshing. The “strawberries” were quite a bit different than what we’d call strawberries, they were more like shriveled looking blackberries, which were a little bit bitter, but infused with some sugar in ice water, they tasted divine. We spent the remainder of the evening in our room, with one exception of going out for dinner and Chandler going to the grocery store for some food for our upcoming ride along the Ho Chi Minh Highway. 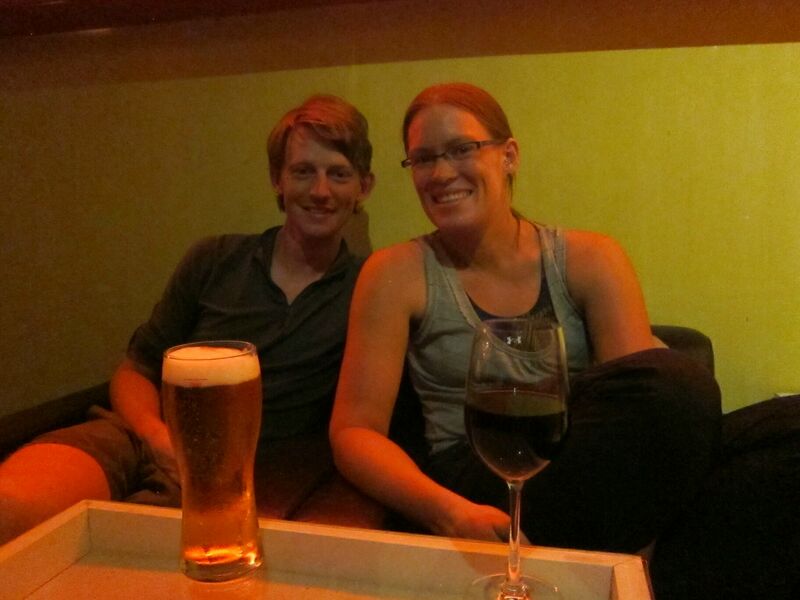 While he was out, he ran into Leonie waiting for the bus to Hanoi. I wish we had made it to town sooner so we could have hung out with her again! While we had discussed Chandler wearing his new suit for the duration of the trip, we decided it would be better if it got sent home along with the souvenirs we had collected so far. This ended up taking a while. There were several forms to fill out with information about everything we were mailing and its value. The woman working the desk then packed everything up for us and taped every inch of the box. Nothing is escaping that package. Hopefully it gets home in a few months. At this point it was getting kind of late in the morning. 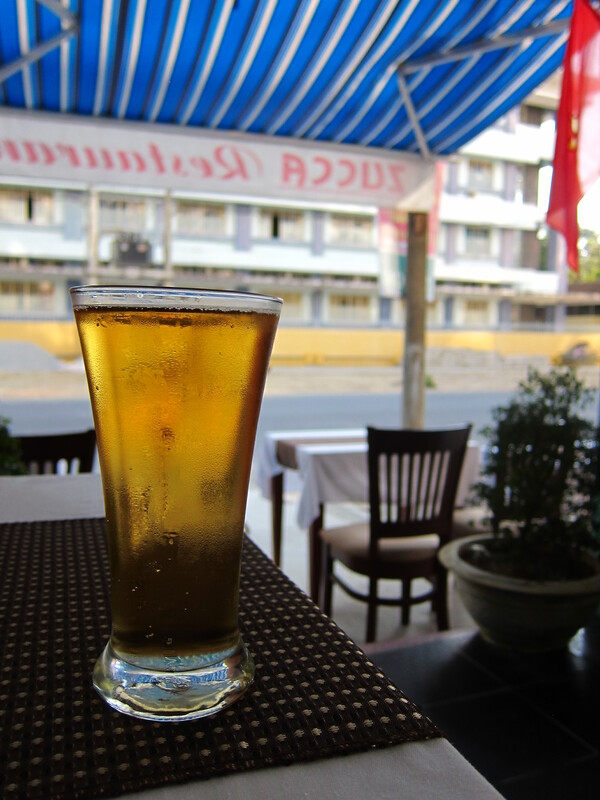 We went back to the hotel for breakfast before hitting the road back to Da Nang. Although the hotel was pretty expensive by our standards ($20/night) they had a decent free buffet style breakfast, with fruit, fried eggs, baguettes, and best of all, peanut butter! We had a huge breakfast every morning, which gave us a lot more energy during the day and improved our moods in general. The Grassland Hotel got a pretty bad rap on tripadvisor, but we’ve learned to take those reviews with a grain of salt, or usually disregard them completely. There seems to be a wildly huge gap between people’s expectations and what $10-$20 can really buy you regardless of where you are. Overall, it was one of the better stays we’ve had on the trip. 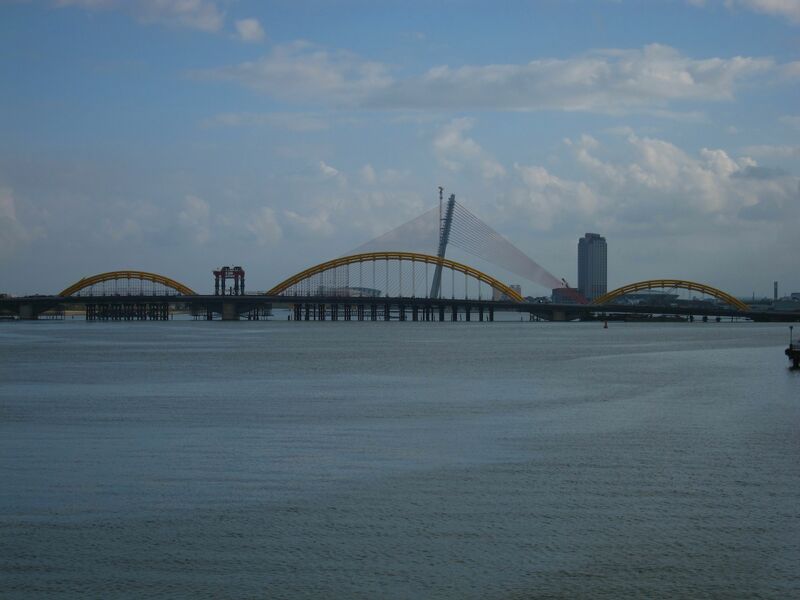 Having already done the route between Da Nang and Hai An once, we peddled quickly to reach new territory. We didn’t really have a plan for the day. Maybe we would stay in Da Nang again so we could do the 550 meter Hai Van pass in the cool morning or just grind over the pass to get some distance out of the way and stay in Lang Co. We talked about our options while passing through the north side of Da Nang that was clearly the more rundown section of town. Chandler was not inspired by the decrepit hotels we were seeing and I was not interested in conquering the pass in the mid-day heat. 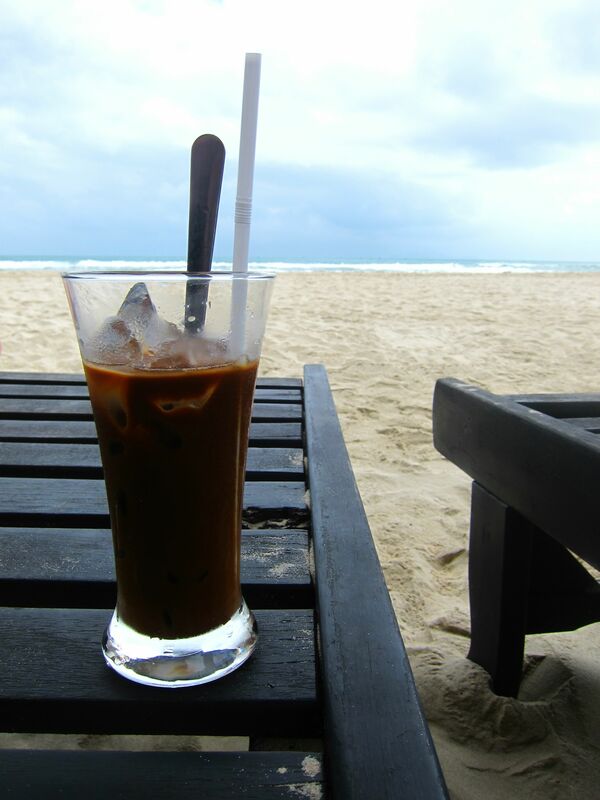 Eventually, we agreed to take a long break over café sua da. An hour later, we hit the road again to bike up the pass. The sun was burning up the sky but there was a cool breeze coming off the ocean. Hai Van was the first real pass we’d done in over a month and the first 50 vertical meters were killer. We decided to take water breaks with every 100m of elevation gain. Suddenly, the clouds came out and the traffic thinned to only motorbikes and lumbering fuel tankers since everyone else was in the tunnel bypass below. The cool and quiet really helped our stamina and we ended up crushing the pass! Motorbikes were waving and cheering us on, we felt so strong the entire time. When we got to the top, we both mentioned we felt like we could have climbed double the distance. The top was beautiful but not relaxing. Immediately, peddler ladies descended, blocking our path, trying to sell us sodas, bracelets and mentos. We politely declined which got rid of most of them, but an old lady really tried playing the guilt card hard mumbling something about no babies, holding her hand out for money. We ate a quick snack of Oreos, drank some water and chatted briefly with one younger sales ladies who made one last ditch, half hearted and friendly effort to sell us a bracelet before we dove off the other side of the pass. Flying down the mountain, again we were cheered on by passing traffic. Someone actually videoed us for a while with their cellphone, which has happened a few times in Vietnam. Eventually, we joined up with the regular traffic coming out of the tunnel and biked into town. Our plan was to cruise through town to get the lay of the land and then pick out a hotel. We saw a couple that looked promising, when a woman on a motorbike pulled alongside me and stated she had a hotel. This happens all the time in Vietnam, so I didn’t think anything of it. Normally, the places people offer turn out to be dives and we pass. We were pretty tired, and the lady seemed OK, so we let our guard down a bit. The woman took us to one of the hotels we had passed by already, which looked OK. We asked about the usuals, hot water, wifi, a place to store the bikes, etc and she said yes they have everything and the price was right. It wasn’t the cleanest place, and it smelled a little bit, but we were exhausted and ready to shower and chill out, so we took it. Once Chandler agreed to the room, her demeanor changed instantly which was a bit weird. Chan asked the price again and she raised her original quote by $5 “because of Tet”. Chan was a bit pissed at this point, as we’d already partially unloaded the bikes and locked them in another building. OK, we’ll go somewhere else. She agrees to the original price and helps us carry our bags to the room. Now she says, I come back and give you massage? She claims to be number one in town. No, I need a shower and to eat first. OK, she has a restaurant where we will have dinner. Hmm, sure, whatever. Please leave our room now. We take showers, relax for a bit and forget about the odd interaction with the woman. The owner of our hotel in Da Nang raved about the cheap seafood in Lang Co, so we decided to walk around town and see what was offered. About 5 minutes away from the hotel and someone is honking at us and yelling for us to stop. Crazy lady has tracked us down on her motorbike and is demanding that we eat at her restaurant. We try and tell her we are just going to a walk to see the town, but she says we have to go back now and we can walk after dinner, in the dark. At this point we realized we had checked into the psychotel. We managed to get rid of her by saying maybe we’d come back later. She seemed pissed and we were now a little worried about our bikes and gear. At this point, we really want nothing to do with her, the hotel or the restaurant. However, she has our passports (which is required at every hotel because they have to report to the police every night who is at the hotel) and we both get the feeling she is the kind of person who will try and sabotage us if we don’t play nice. We didn’t really find any great looking restaurants and as the sun was setting, we headed back to the hotel to grab some dinner. Crazy Lady was not around thankfully. The rest of the hotel staff were really very friendly and made us a nice dinner of noodles and vegetables that turned out to be really cheap. But where is Crazy Lady? At this point, we want her to see us eating at her restaurant so things will go smoothly in the morning when we need to leave. Finally she shows up on her motorbike, probably searching the streets for us, and sees us finishing dinner. She invites herself to sit at our table and is now back to being happy Crazy Lady. She understands that we will be leaving early in the morning and since we already paid, she says she’ll give us our passports back that night. She made some casual conversation about our route north that actually turned into a devious attempt to sell us a map. Then she starts asking about the massage again, which once I decline, she decides to change her mind about the passports and will give them back after we eat at her restaurant in the morning. Not wanting to deal with crazy any longer, we declare it bedtime. She then tried to sell us a bracelet of course. It was only 7pm, so we turn off the lights in our room and watch the new James Bond movie with our headphones so everyone will think we are sleeping. Morning cannot come soon enough. 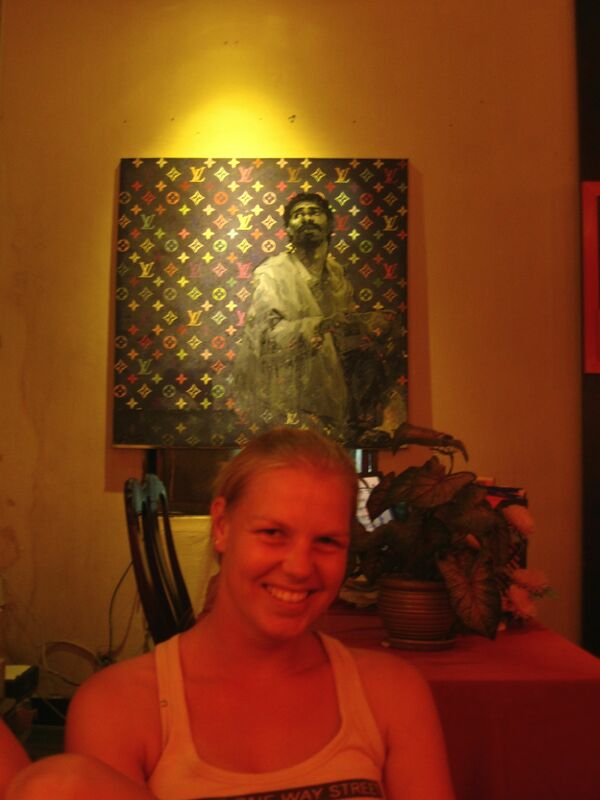 Moral of the story: Do NOT stay at the TRIEU VY Hotel in Lang Co.
We got up early to have breakfast with Leonie. She was taking a bus to Hue and then Hanoi. This would probably be the last time we see her until Europe. As usual, we had a lovely time and were sad to see her go. After dropping Leonie off at her hotel, we decided to go on a little bike ride around town. We headed down a main road, which wound through a neighborhood. As the road got narrower, the English signs disappeared. As we were talking about how tourists probably don’t often see this side of town, a huge tour group of westerners on rented bicycles go riding past us. Oops, nevermind. 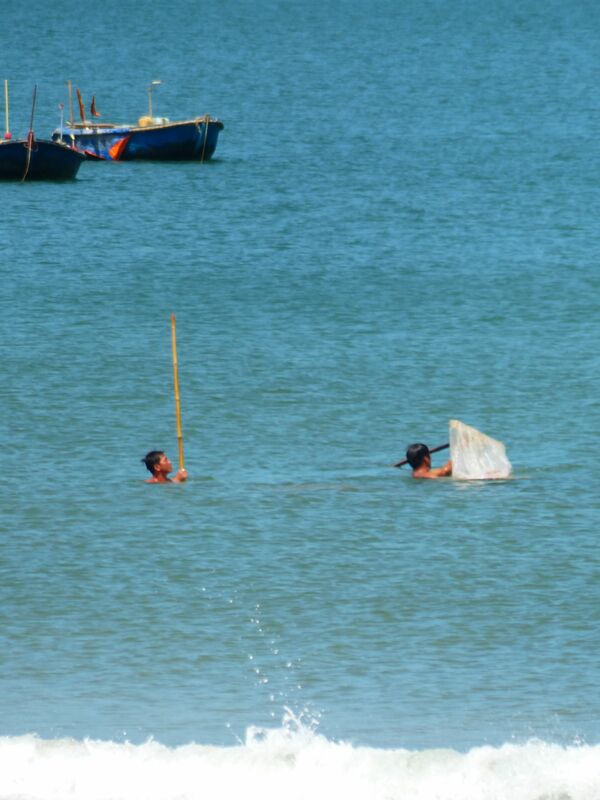 Eventually, we found our way to the beach a few kilometers outside of town. As Chandler was locking our bikes to a palm tree, the beach patrol blows his whistle and motions no parking. We have to walk back down the street, park at a café which was apparently the designated parking area and pay someone for the privilege. 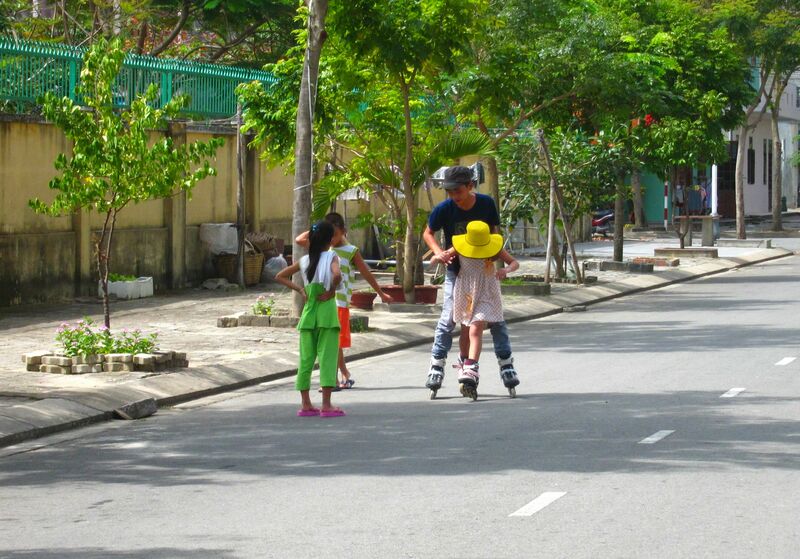 This is another part of the Vietnam culture in tourist areas that really frustrates us: Small, pointless rules are occasionally vigorously enforced (often with a whistle), while seemingly more important things like basic traffic safety is left to chaos. After protesting a little with whistle boy, motioning to the other bikes and motos that locals had strewn about the entrance, we decided to keep riding, as it was very overcast and windy- not the best beach weather anyways. We were getting excited for Chandler’s fitting but I must admit, I was feeling left out of the fun. As we rode into town we passed a small out of the way tailor shop with several linen pants on display. Chandler and I both put on the breaks at the same and turned around to have a second look. The shop owner immediately pulled me into store to pick out a fabric color the moment I expressed the slightest interest. She took a few measurements and told me to come back at 5 that night. Back at Mr Xe’s, Chandler was sent to the back room to strip down to his skivvies (your welcome for not posting that pasty white photo). The pants were a perfect fit the first time. One of the dress shirts was a little too snug across the shoulders and the collar on the suit jacket didn’t lay right. Mr. Xe was all over it and took Chan back to the sewing room, fully dressed in his suit on the back of a moto. The small fixes would take only a couple hours. At 5pm, we are back at my tailor to try on the pants. I am 5’8 1/2 so I have trouble finding pants long enough that aren’t jeans. It was kind of amazing to put on the pants and have them fit immediately. 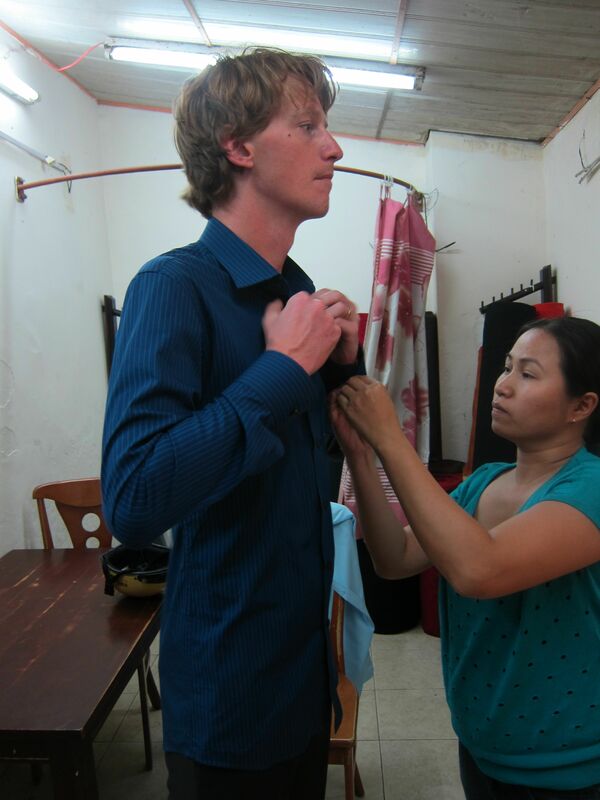 The tailor wanted to make a slight adjustment because the hips were too loose, so we’d have to come back in an hour. 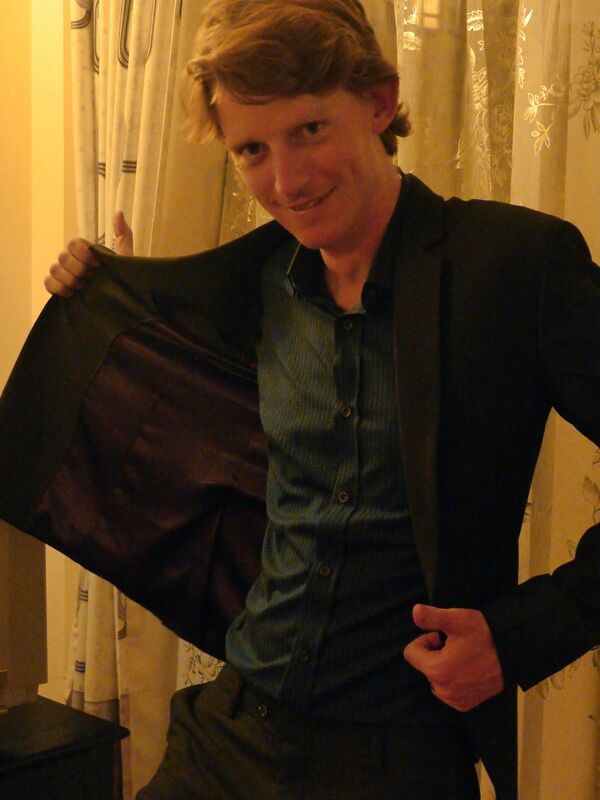 We head back over to Mr Xe’s for Chandler to try on the too snug shirt and funky collared jacket. Now everything looked and fit great. This was their second day of being open after Tet, and they had apparently done very good business- Mr. Xe was in a great mood and handed me a coke and Chan a beer to enjoy in front of his shop. After our suit fitting mini celebration we took a spin back over to pick up my pants and everything is ready to go. Fashion show time! 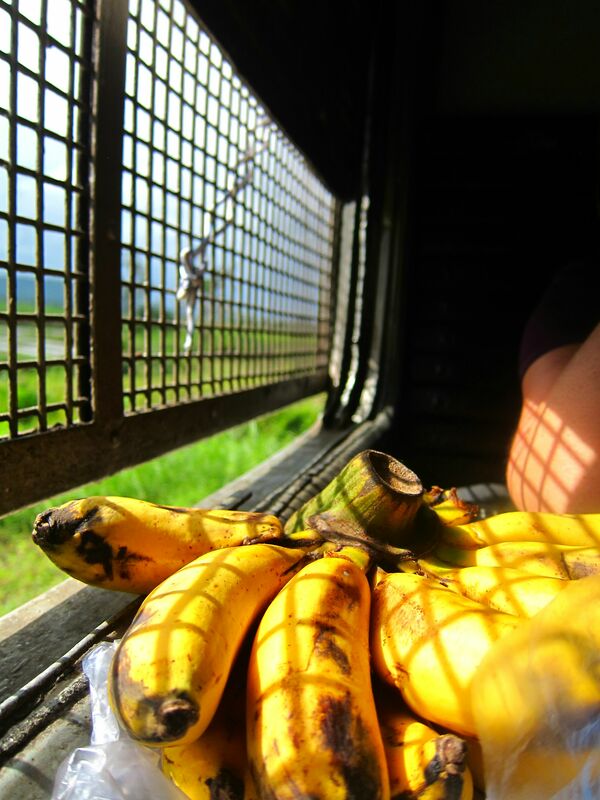 All our running around left us hungry, so we headed back to the river for some local food. Lucky for me, the kid taking orders spoke English and I was able to get some noodles without any meat. 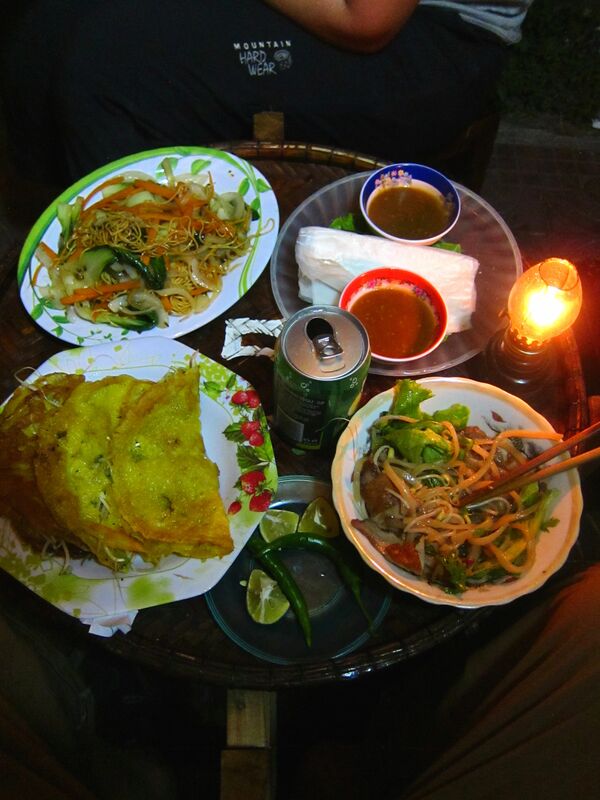 Chandler decided to get a feast of banh xe which were oily little crepes with mung beans and shrimp in them eaten torn up with fresh greens in spring roll wrappers, and a bowl of cao lau. 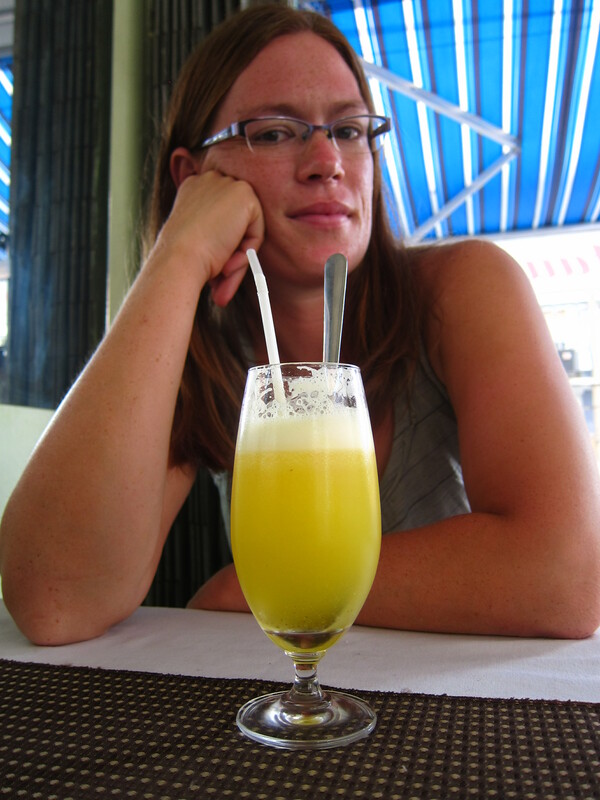 We had a nice chat with an Australian woman on a holiday, on her way to Cambodia. She was doing her best to fend off a young girl who was trying to get money out of her by asking her for “souvenir money” from Australia for her “collection”. 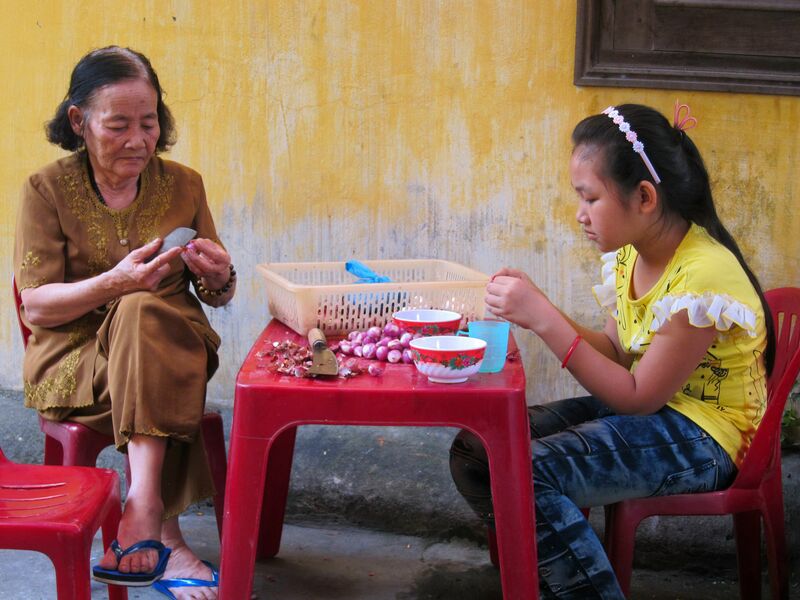 The woman gave the girl a coin, and after a little while the girl came back demanding more money, apparently having determined the value of the coin was not that much. It was quite a ridiculous scene, and very sad. We have heard and read that these children are often simply agents of larger gangs, and do not really profit much for their efforts. 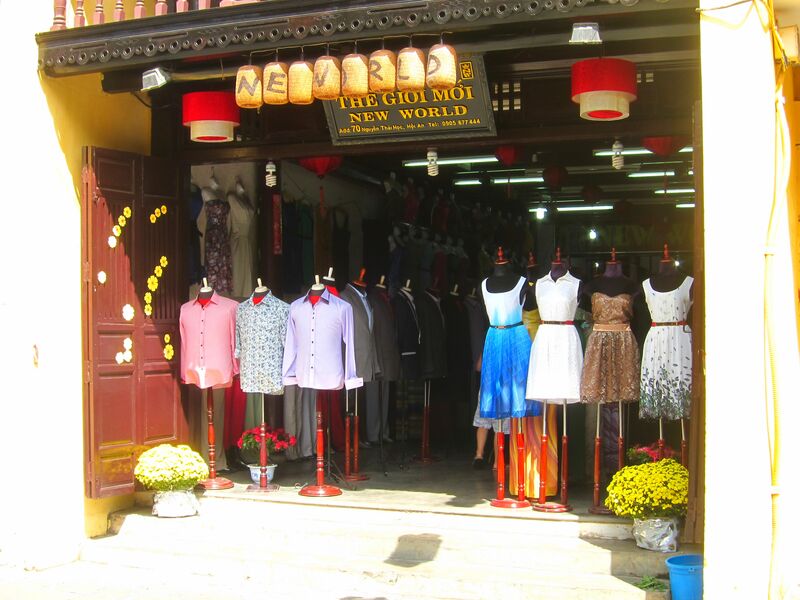 Hoi An is home to hundreds of tailor shops. 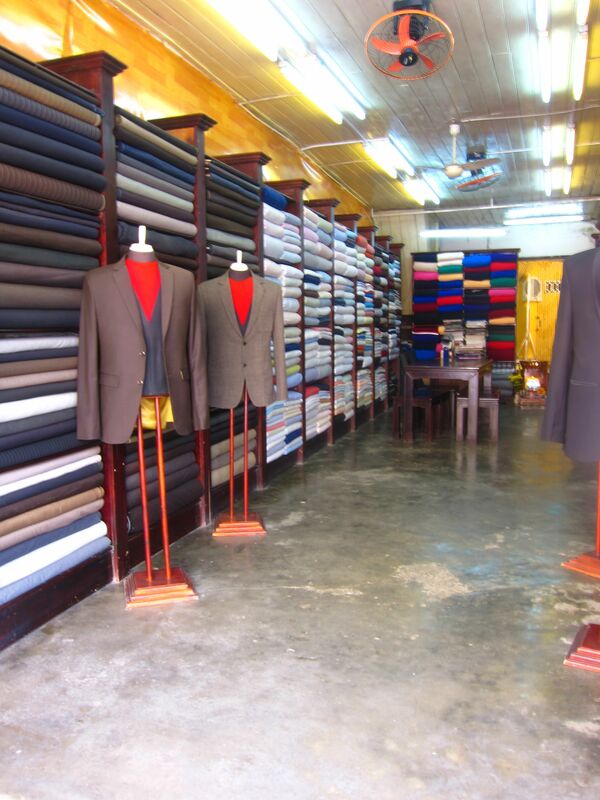 It is the place to have custom made clothing done in Southeast Asia. We went back and forth about having clothes made for us. I read a lot of blogs prior to coming to town to learn about people’s prior experiences. I had settled on Mr Xe for a suit for Chandler and either A Dong Silk or Miss Forget-Me-Not for myself. We spent the morning wandering around town looking for the cloth market as the temperature got warmer and were constantly hassled by people. “Hello, you buy something.” I was never able to find Miss Forget-Me-Not in the cloth market. Next, we went over to A Dong Silk, which quoted me $80 for a basic dress. This was quite expensive. 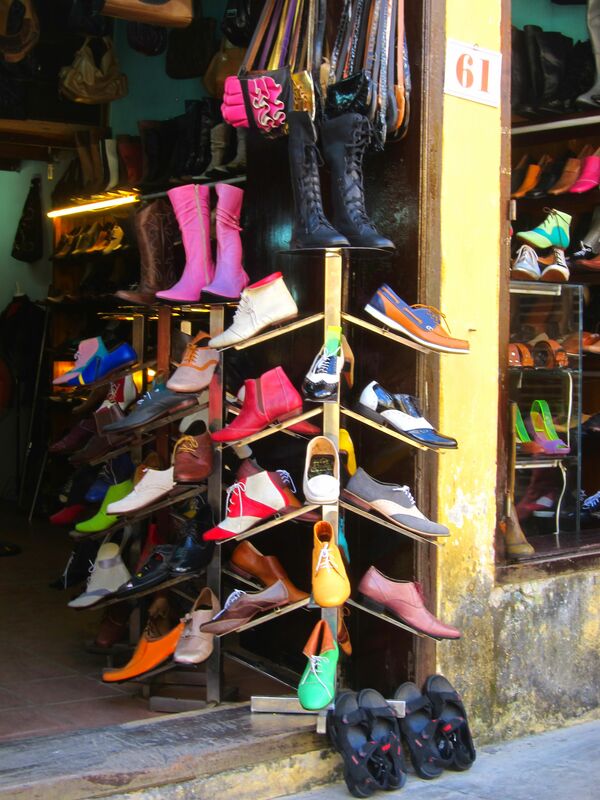 Haggling is customary here, but we had grown weary of the wildly overpriced initial quotes on everything from fruit to dinner, which required sometimes less than good-natured back and forth to settle on something “reasonable”. I wasn’t in the mood to try to get them down to around $40 which was more of a fair price. I’m not great at haggling either, and Chandler was getting frustrated with my fear of playing hardball with the sales ladies. We tried another shop but they also gave a quote of $80 after we spent a half hour describing the dress idea I had. They also kept trying to get me to have it made in a fabric that I didn’t like. As we walked out the door, the price started to drop. With each step $10 came off, $70, $60, $50. At this point we really were not having fun, so we decided to skip the whole thing and go back to the hotel. Then we walked by Mr Xe’s shop and he had some shirts on display. An assistant inside caught us looking and pounced. They offered to make Chan some shirts for $16, and the fabrics looked nice. Of course they also wanted him to have a suit made, and made a pretty reasonable offer of $120. The prices were pretty much in line with what we had read they should be, so he agreed. At this point, Mr Xe himself made an appearance to measure Chan. He had Chandler remove his shirt and took about 37 different measurements twice. 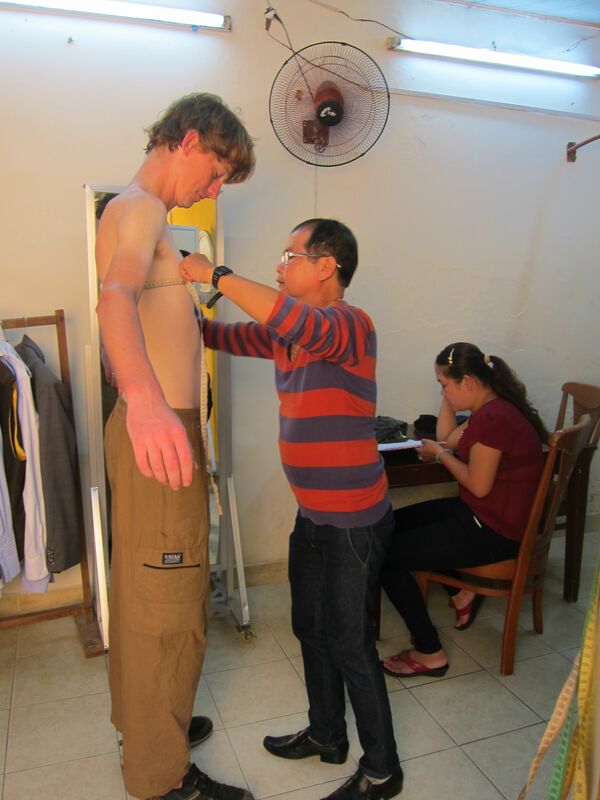 Chan was then whisked away on a motorbike to a small sewing room full of young men sewing suits, where the head tailor there independently measured him again. The whole process took about 20 minutes and were told to come back the next day at 2pm for a fitting. Feeling in much better moods, we headed back to the hotel to escape the heat. The temperature becomes bearable again around 4, just in time for a walk about town before dinner. 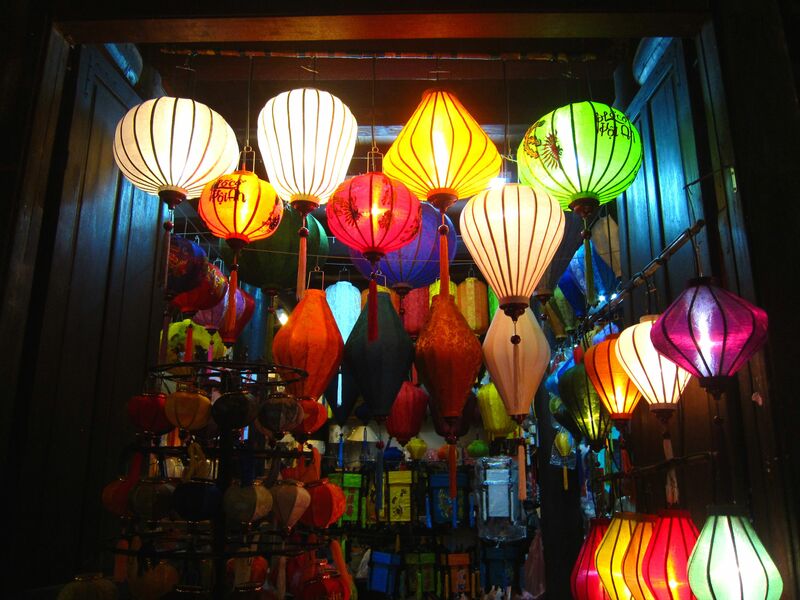 Hoi An is also known for it’s silk lanterns. 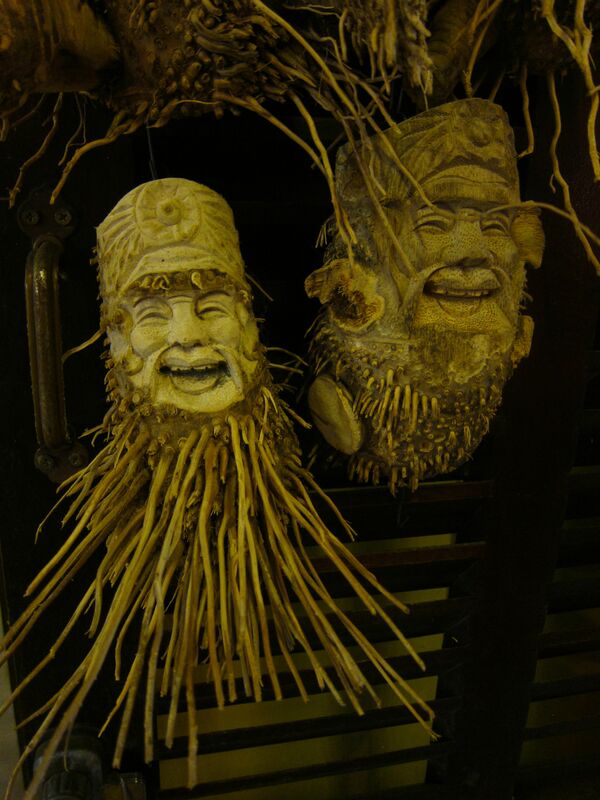 Every street was decorated with them. They were especially nice all lit up at night. With Tet celebrations coming to an end, we also saw many people dressed up. 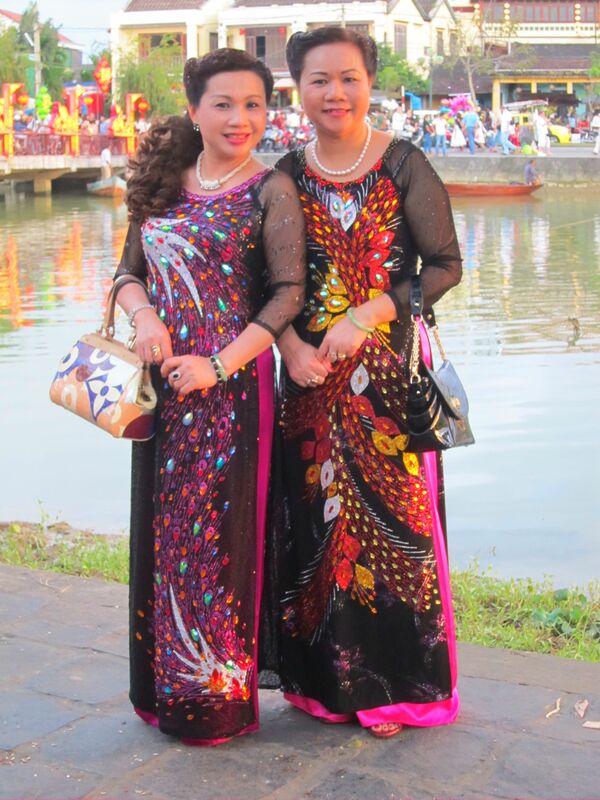 Many of the women wear traditional clothing everyday, but what we were seeing must have been their formal wear. Dinner was at a little Vietnamese place by the river, nothing amazing unlike dessert. 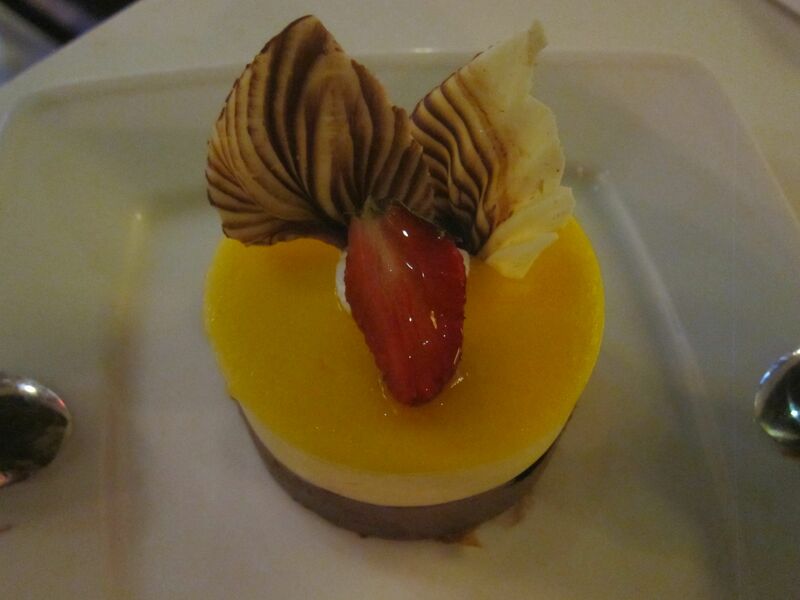 There are a number of cafés with delicious looking treats and we could not resist. The remainder of the evening was spent wandering around trying not to buy everything. 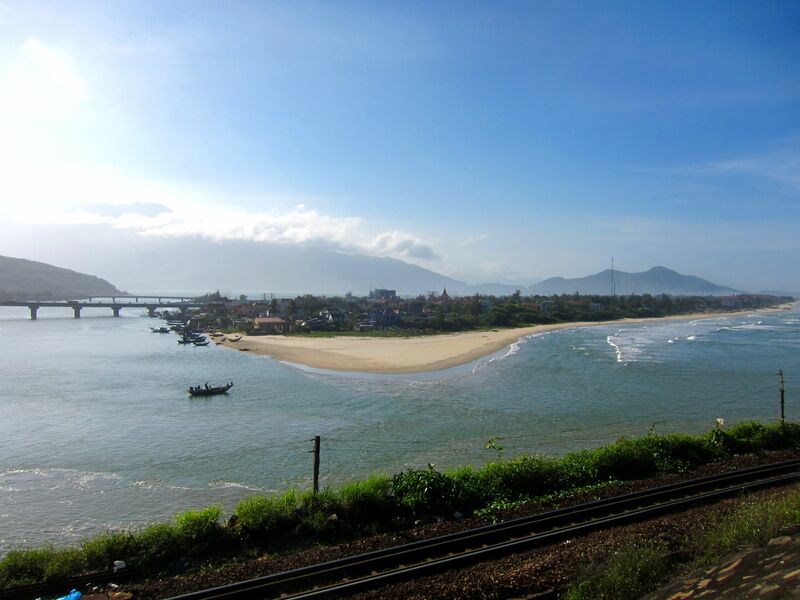 Hoi An isn’t very far from Da Nang, so we took advantage and tried to sleep in. Chandler isn’t very good at sleeping in, but he left so quietly, I was able to. When he returned around 9, he had bought 2 roses for me for Valentine’s day. What a sweet guy! We ate a delicious meal at our hotel and were ready to go. While Chandler paid, I had a good time watching a boy try and help his sister learn to roller blade. Despite falling a lot, them appeared to be having fun. 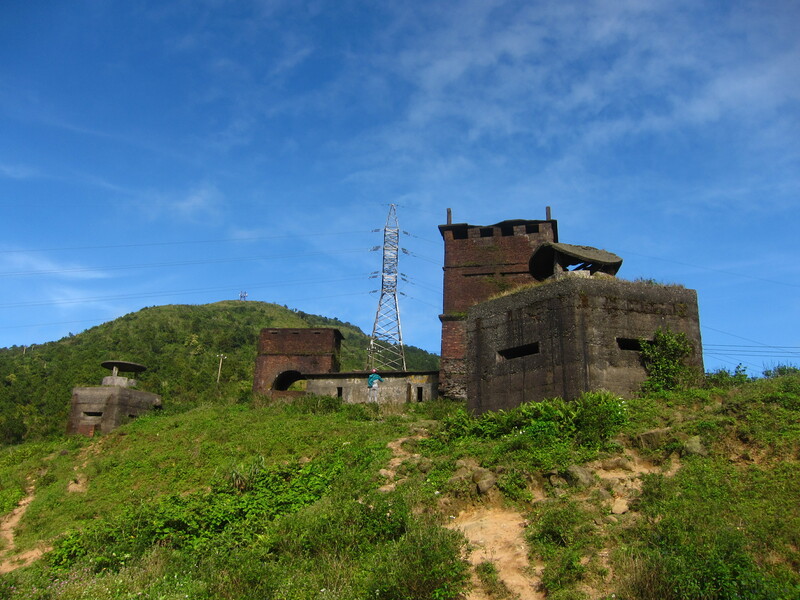 The ride to Hoi An was OK. Theoretically, it followed the coast south, but pretty much the entire left side of the road was either gated sea side resorts, or land set aside for future sea side resorts, with big metal walls preventing us from seeing anything. It turned out to be one of the less scenic rides of the trip so far. 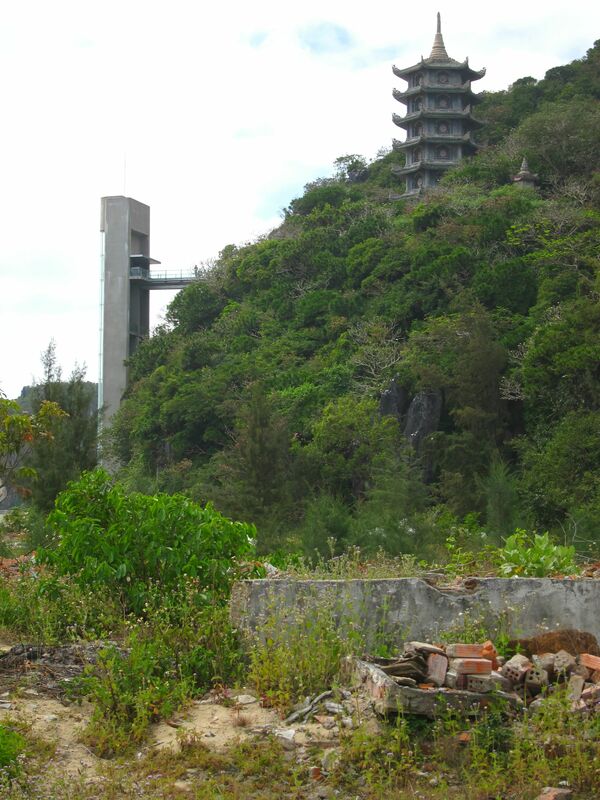 There was a interesting temple perched up on a limestone crag, but there was a modern elevator structure next to it and a bunch of buses, so we figured it might have just been a tourist trap. 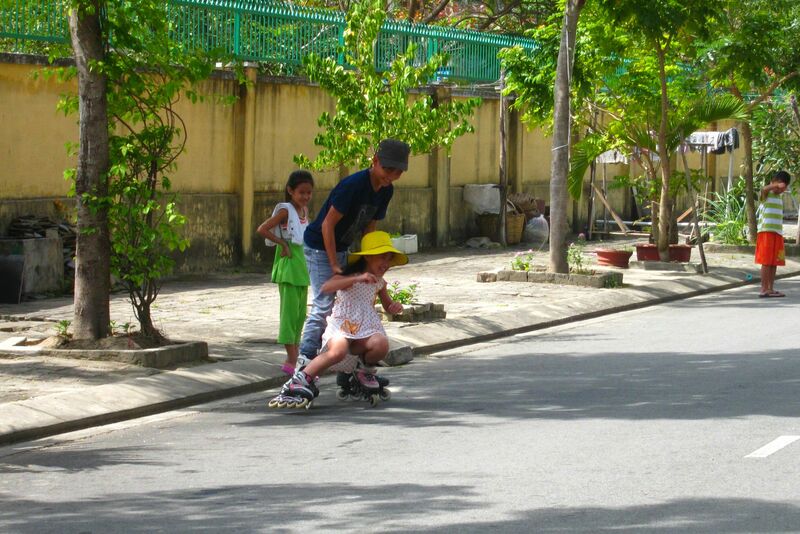 We rolled into the Hoi An around noon. Finding an affordable hotel was tricky. We tend to be a little picky and aren’t willing to pay for somewhere that smells like mold or cigarettes. After four attempts, we settled on the first place we looked at, which was pretty far out of town. 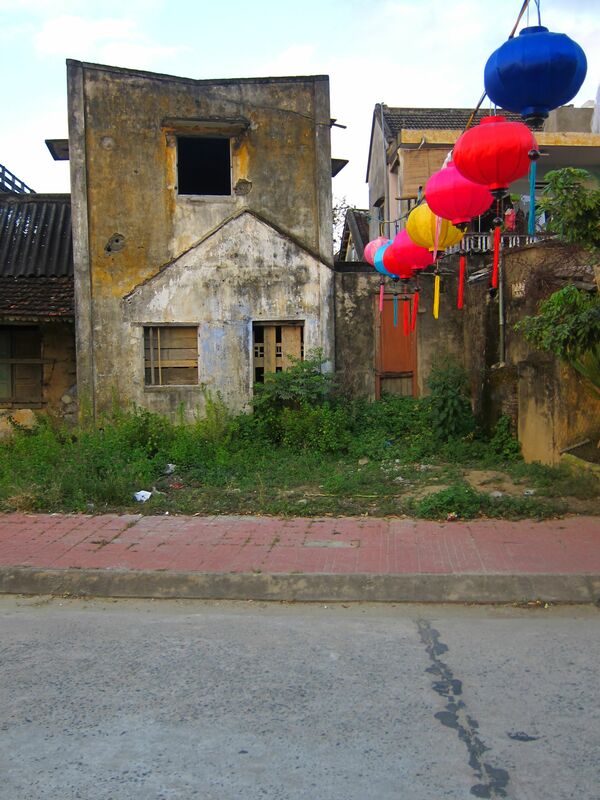 This turned out to be OK. Hoi An is a pretty small town, but it was completely over run with tourists. 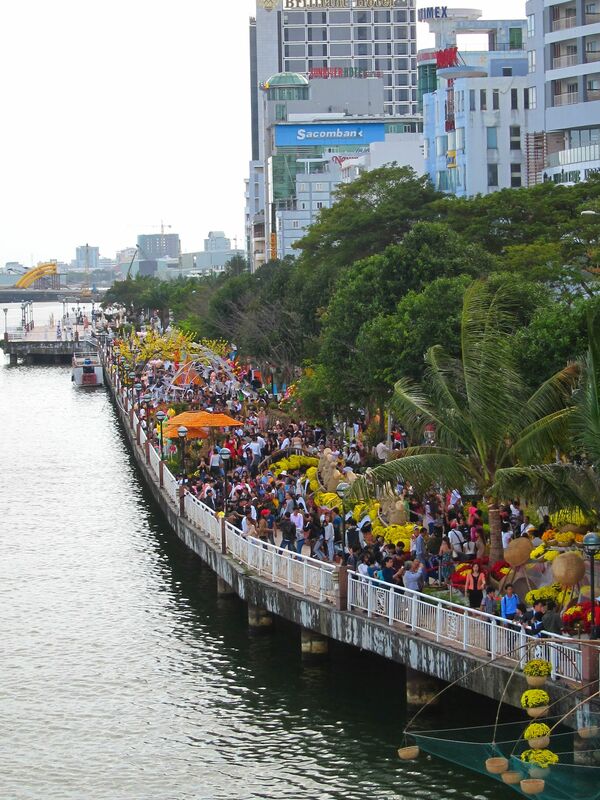 The streets closest to the river were packed with people taking pictures, buying souvenirs and just wandering. 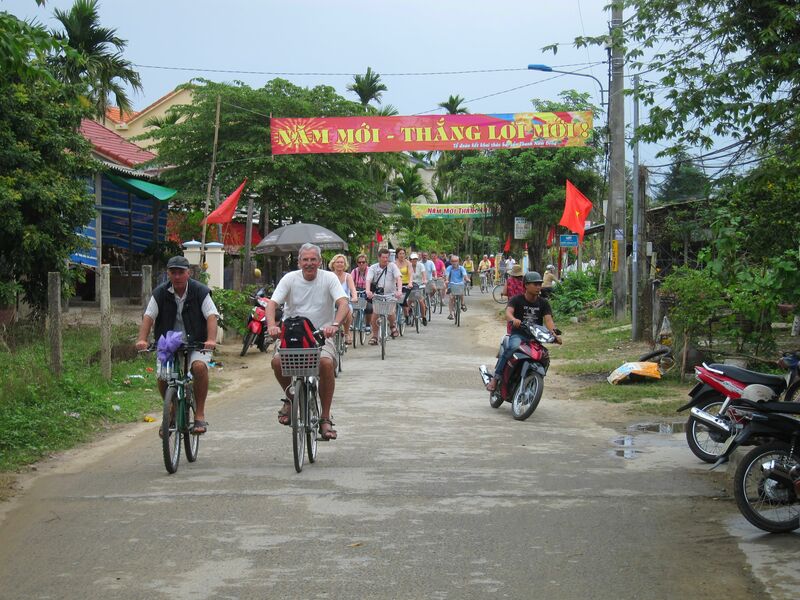 We found it too difficult to ride our bikes through the crowds, but many local vietmanese didn’t seem hindered on their motorbikes, horns blaring of course. 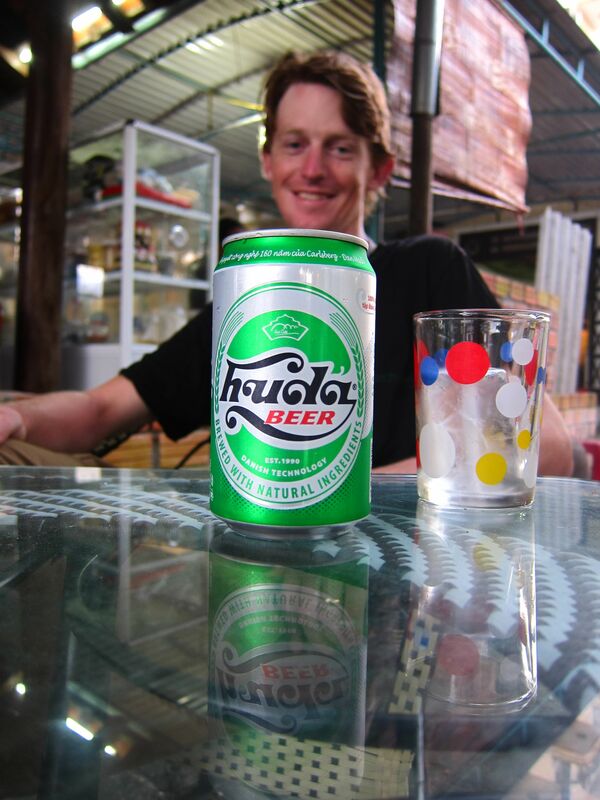 Chan had done some brief research ahead of time about local food and discovered the local specialty, Cao Lau. 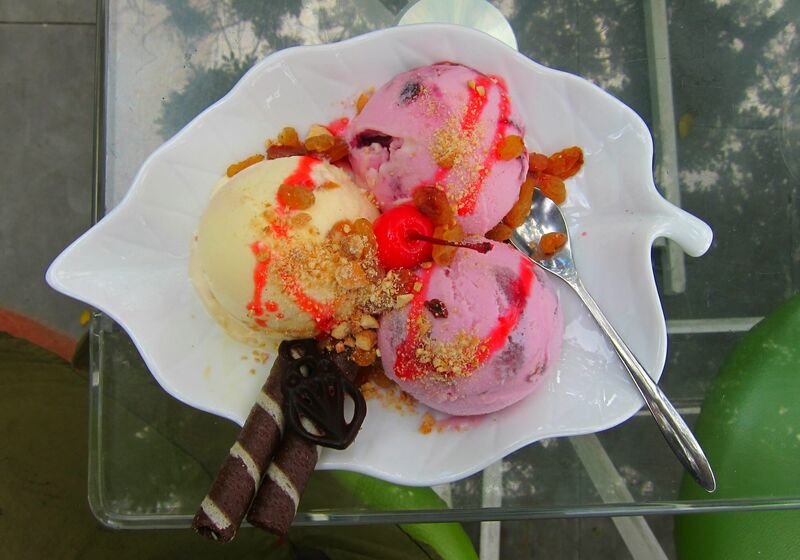 It turns out that this is no secret with pretty much every restaurant in town serving up some variation of it. Unfortunately, this is a meaty dish so I could not enjoy it too. The noodles are what make it stand out. They are thick yellow noodles apparently dyed with the ash of a local tree. 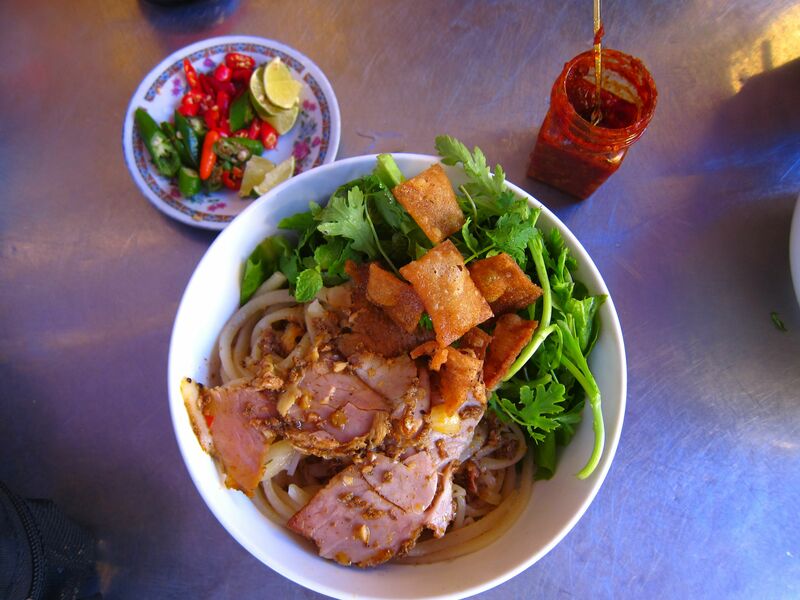 The noodles are served in a bit of broth with slices of pork and pork cracklings, along with a bunch of leafy greens. This picture is of the first Cao Lau Chan had, which he declared far superior to all the rest he ordered while in town. 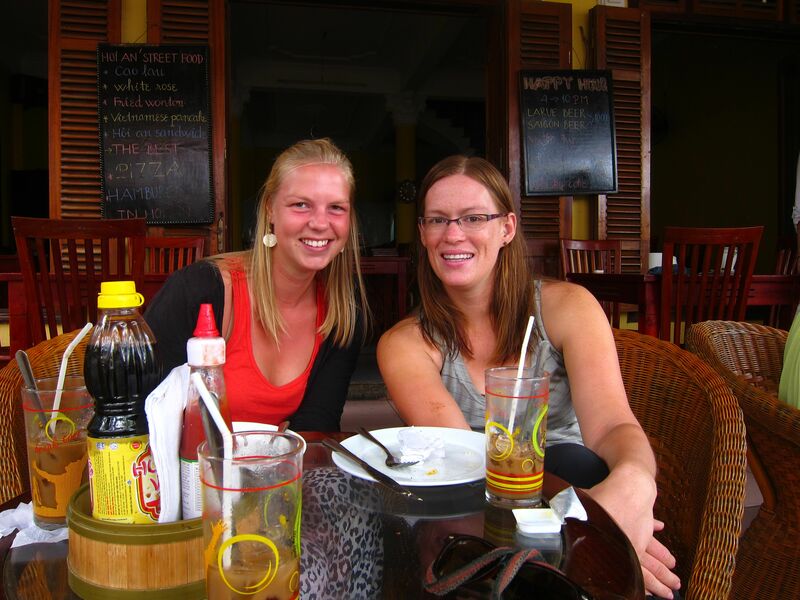 Our friend, Leonie, had taken an Easy Rider Motorbike tour from Dalat to Hoi An, so we were really hoping she was still in town. I emailed her the moment we had Internet. Right when we were about to leave for dinner, she responded. Yeah! We had a lovely dinner and then went to a bar for a few Valentine’s day drinks. It was really nice hanging out with Leonie again. She had some interesting stories to tell us. We were so happy to be able to meet up again. We ended up staying out really late, and the hotel had already closed the gate. A staff member was up waiting up for us. I felt like we had been caught sneaking in past curfew. We had another sleepless night due to Chandler’s cough and another early morning as we had to pick up our bikes. The hotel called us a cab and explained the situation. Once we got to the bus depot, the cabbie called the bus driver, found the right bus, dropped us off and left. After a few minutes of standing around, not knowing what to do, someone came to help us. We explained that our bikes were on the bus but nobody to get them out. The man who came to help said everyone was sleeping on the bus and to just knock on the door and wake them up. I ended up opening the door and shouting for somebody to get up and get our bikes. We got the bikes, but nobody looked very happy to have been disturbed. When they packed our bikes into the underbelly of the bus, they took Chandler’s seat off. We didn’t bring any tools with us, but the hotel was only a couple miles away. He was able to get the seat on, but when he tried straightening the seatpost, the bolt holding the seat on snapped in half. We spent most of the day trying to find a bolt for the seatpost. A number of hardware stores had their doors open, but were full of family socializing during Tet. 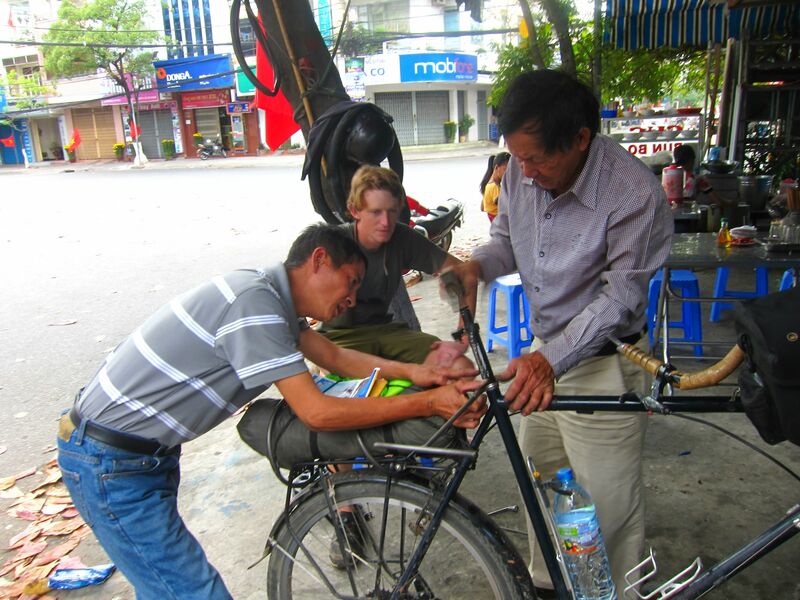 In no uncertain terms they told us to buzz off when Chan showed them his broken bolt and seat. We finally found a moto repair shop that enthusiastically “fixed” the problem by cross threading the seatpost clamp with slightly too large a bolt, a scrap of sheet metal as a shim and the healthy use of a big (F’ing) hammer. 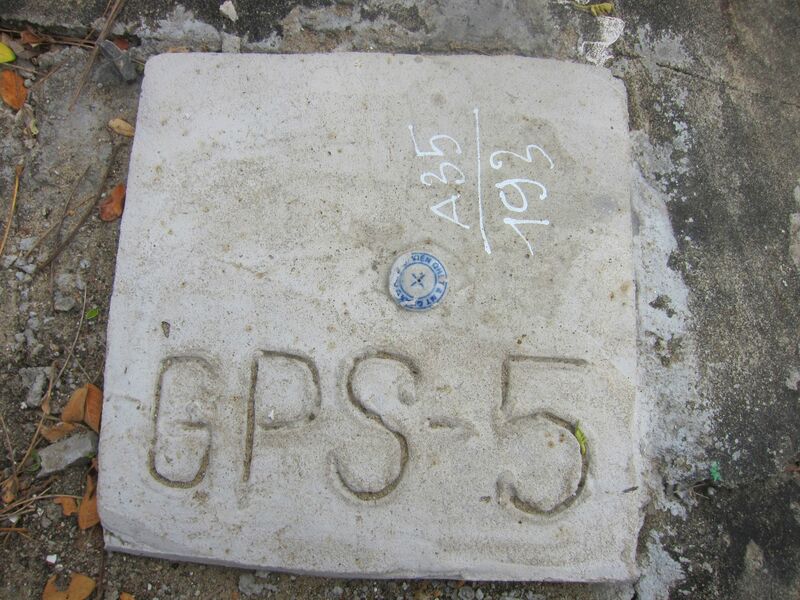 It is hard to explain how it happens, but once a Vietnamese person starts to “fix” something of yours it is impossible to intervene. We spent the rest of the day biking around town seeing the sights. The next day was for relaxing. We spent the morning on the beach reading until it started raining. We spent the afternoon doing some much needed bike maintenance. We had dinner at very small restaurant which was also a surf shop near the beach. They had the best noodles and tofu. We got sucked into staying an additional two hours because of the owner. She was a teenager during the war and had some amazing stories from her life. She was very pro-American, which was kind of surprising to us. We went to bed and got some rest. 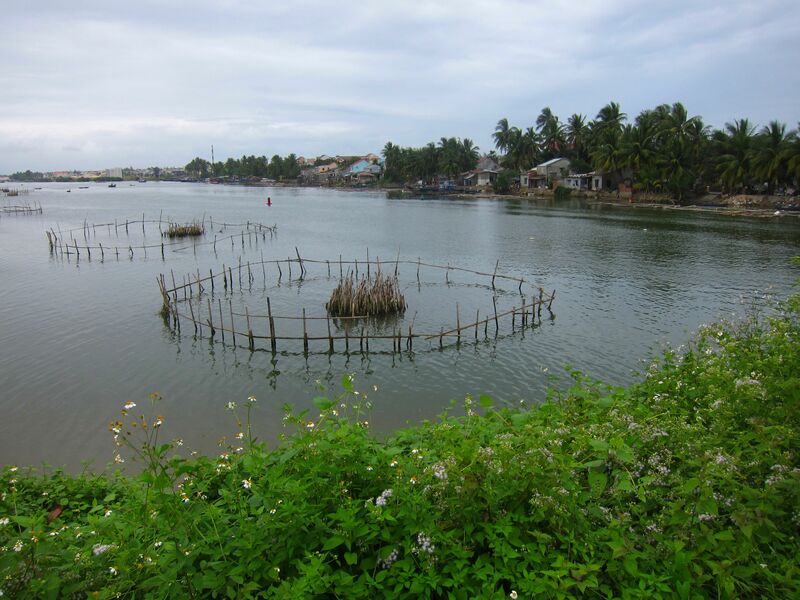 The next day is a short ride south to the touristy town of Hoi An. The purity of our cycling trip has been broken again. 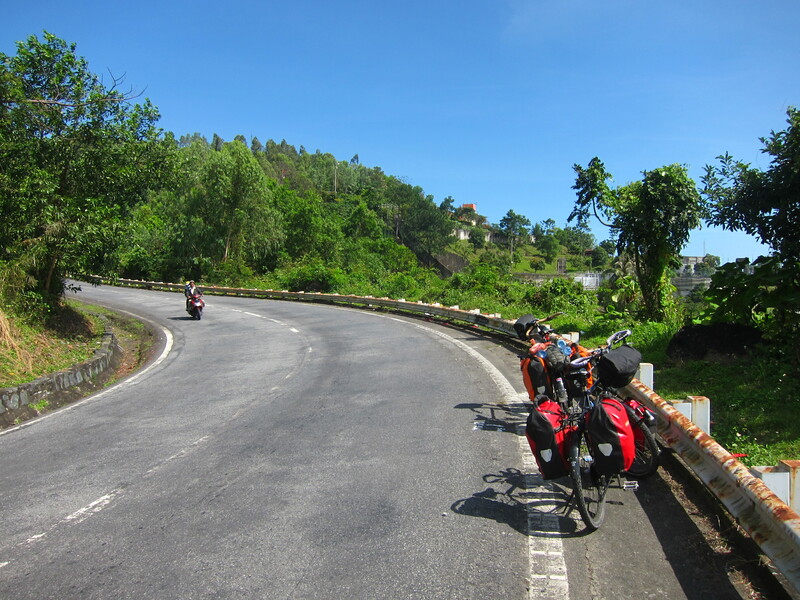 We cycled from Rayong, Thailand to Saigon, Vietnam, then took a bus to Dalat. 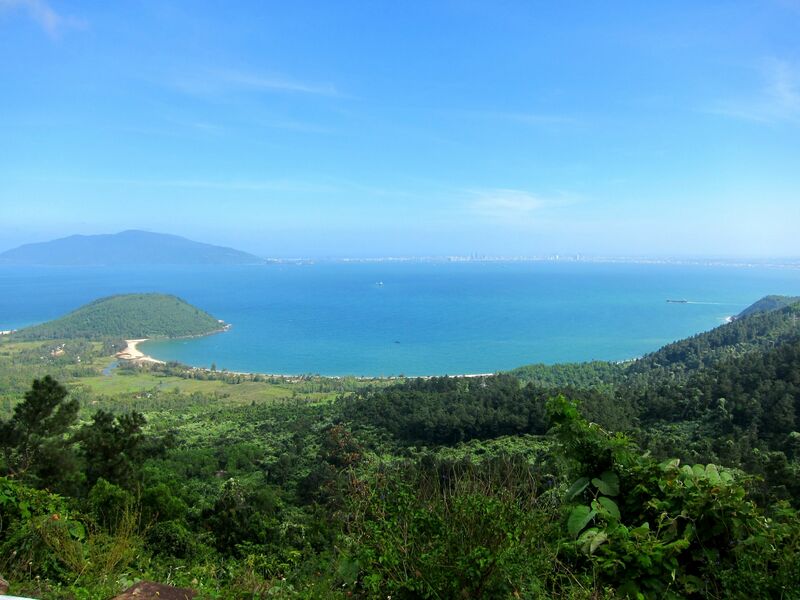 After riding down to Nha Trang we looked at the map and realized again, that Vietnam is pretty big. Our visas expire on the 24th of February and there is still a lot of country to see. Chandler has been feeling pretty bad, and dragging while cycling in the heat. He really needs to rest if he is going to get better. We read a number of accounts online from people riding down highway 1, raving about the very strong tailwind headed south. (Good for them!) 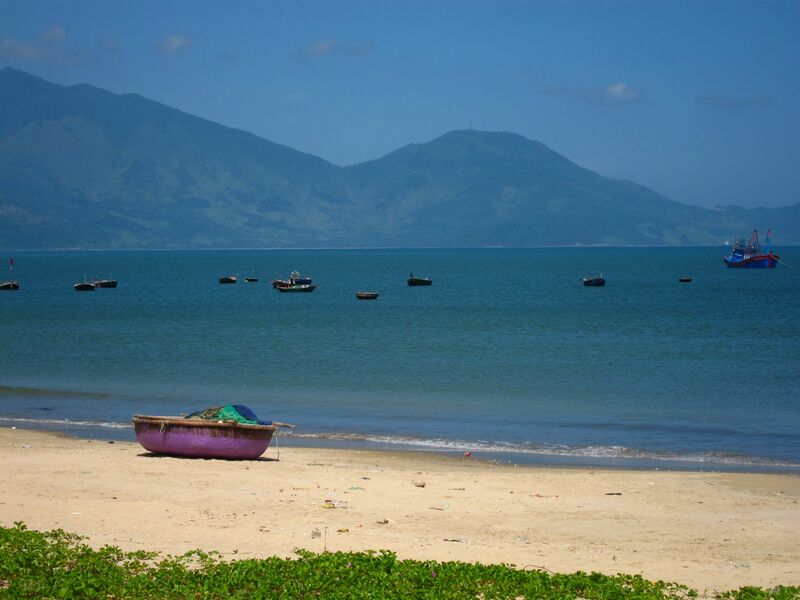 After a brief amount of consideration we decided to fast forward to Danang, a port city in central Vietnam. 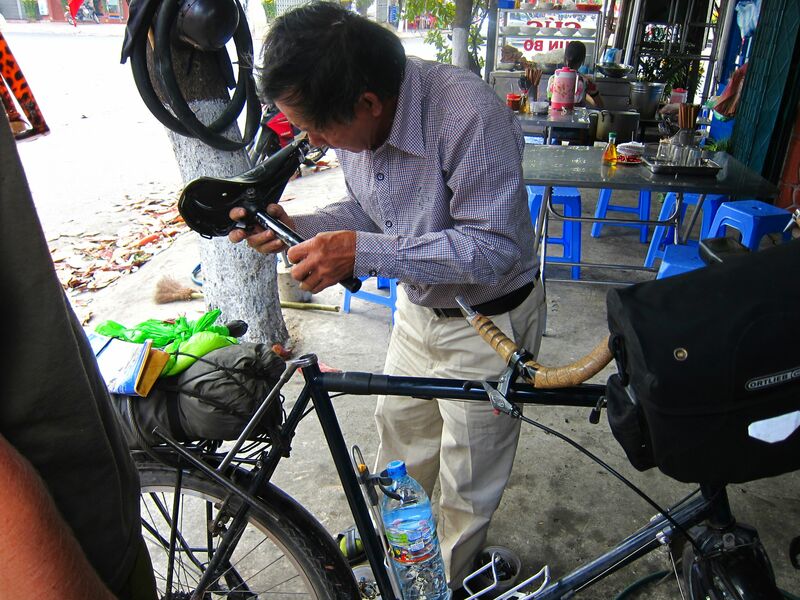 Our hotel called around and found that it was impossible for us to travel with our bikes north because of Tet. They could book us on a train, and send our bikes as cargo on a bus a few days later. We were pretty much out of options at this point and decided to go ahead with the somewhat sketchy plan. We gave the lady at the hotel about $60 and hoped for the best. Later that evening she gave us two train tickets. At 5am the next day, the a taxi picked us up at the hotel and delivered us at the train station without our bikes. The hotel was going to handle sending them north for us, which, needless to say was a bit stressful for us! 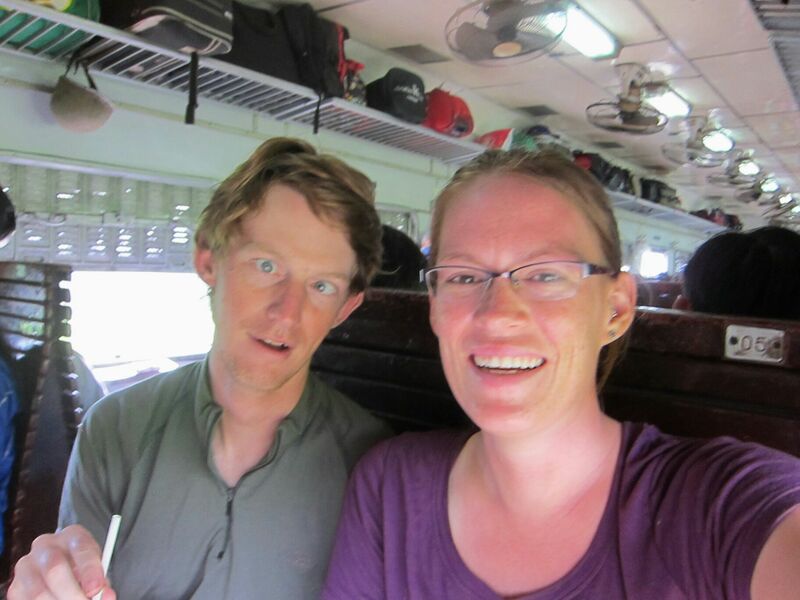 Finding our train and car at the station was straightforward, but finding our seats was another issue. The doors were only open on the end of the car furthest from our seats . 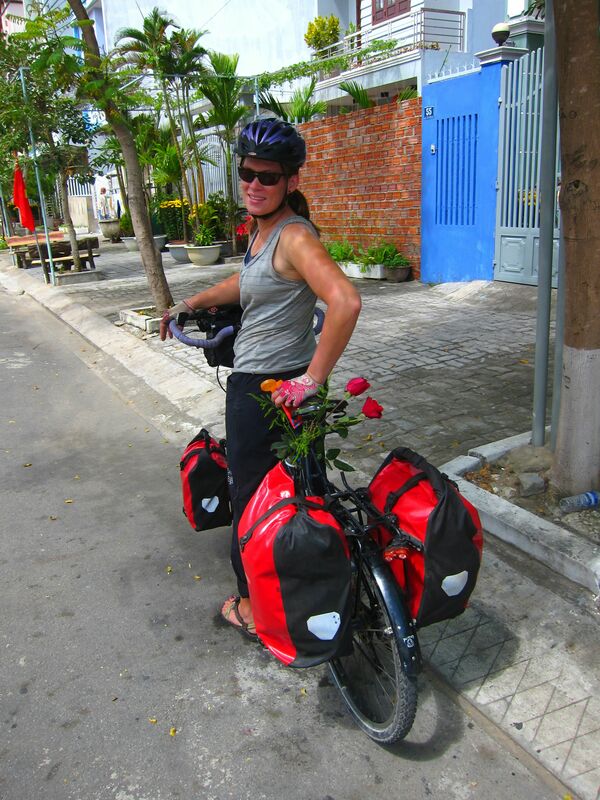 We had to get our 8 panniers and 2 handle bar bag “purses” through an obstacle course of people and things. There were about 4 people laying on the ground sleeping and a huge pile of vegetables, all in the middle of the aisle. I managed to step on only one person and we got settled quickly. The train pulled away from the station and we had only one person sharing our seating area. At the first stop, he left and a family took his place. The patriarch and model father of this family unit had absolutely zero concept of a personal bubble. He would extend his legs out physically forcing Chandler’s into the aisle then refuse to move when food vendors wheeled their carts by, forcing Chan to hover until they passed. He put his feet up across the space between us, resting his nasty socked feet on our seat against Chan’s hip. He also had a little routine he was quite proud of, where he would drink an entire 12oz bottle of water in one gulp then triumphantly toss the bottle out the window. The trash is something that has really bothered us about Vietnam. The landscape is generally gorgeous, but the sides of the roads are strewn with garbage. At home, in the US, there is a lot of trash of the side of the road too, but here there is such a flippancy associated with littering, it drives our western minds a little bonkers. Water bottles out the train window, no big deal. Finished with a soda? Toss that can in the bushes! Driving down the road in your Lexus? Styrofoam takeaway container out the window! The guy even tried convincing me to throw our yogurt containers out the window since they were cluttering up the little table in our area and he seemed a little shocked when Chan got up and tossed them in a trashcan less than 20ft away. (Who knows where the trashcan waste goes after that, but at least we’re trying) What makes this place truly bizarre is that people are borderline fanatical about keeping their personal areas clean, constantly sweeping in front of their homes and businesses, even the sweeping the street in front of where they live, but there is no problem absolutely trashing communal or “public” spaces. Unbelievable. The toilet on the train was a hole in the floor, with everything emptying directly onto the tracks. Each car also had a freshening up room with just a sink. We saw a number of people take their children into these rooms to pee on the floor. 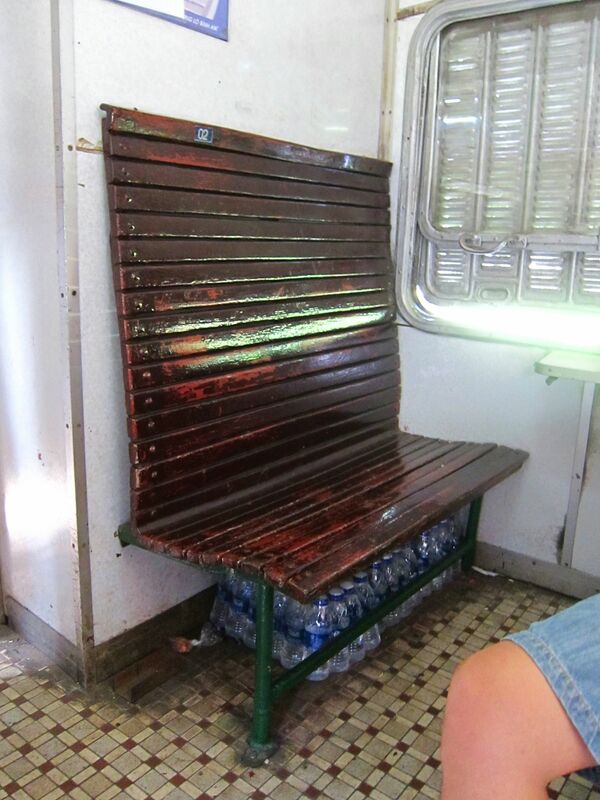 With no drain, the pee would drain out into the aisle as the train shifted. No five second rule here. 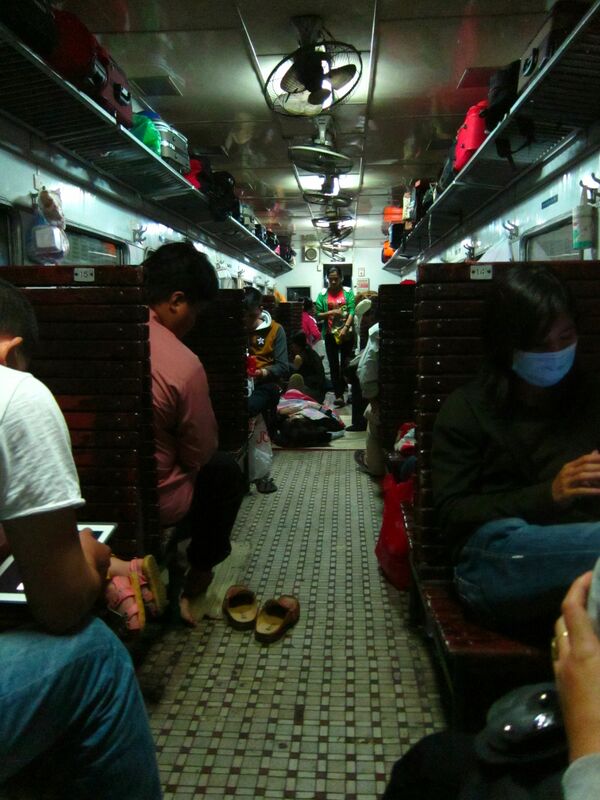 The other aspect of the train we despised was the cigarette smoke. For some reason, people would smoke between the two cars were there were no windows. The smoke would then go to the closest window to escape which was ours. Gross. When the litterbug family left, Chandler and I had the two benches to ourselves for the remaining 6 hours. It was nice to be able to stretch out a bit, but the seats were extremely uncomfortable. Basically, we sat on wooden park benches for 11 hours. As much as I’ve just complained, the train ride wasn’t all bad. We read the entire time. We both started and finished an entire book. The scenery was beautiful. Lots of mountains and rice fields. 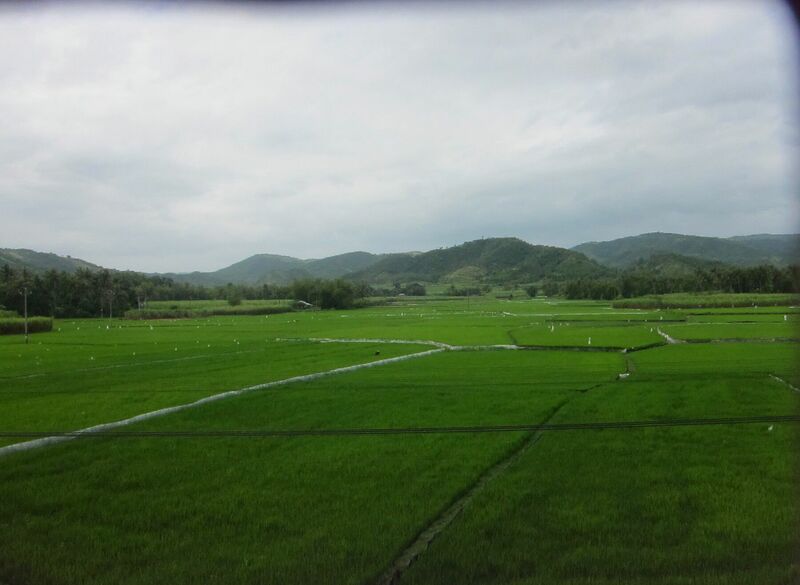 It is incredible how Vietnam is so green. 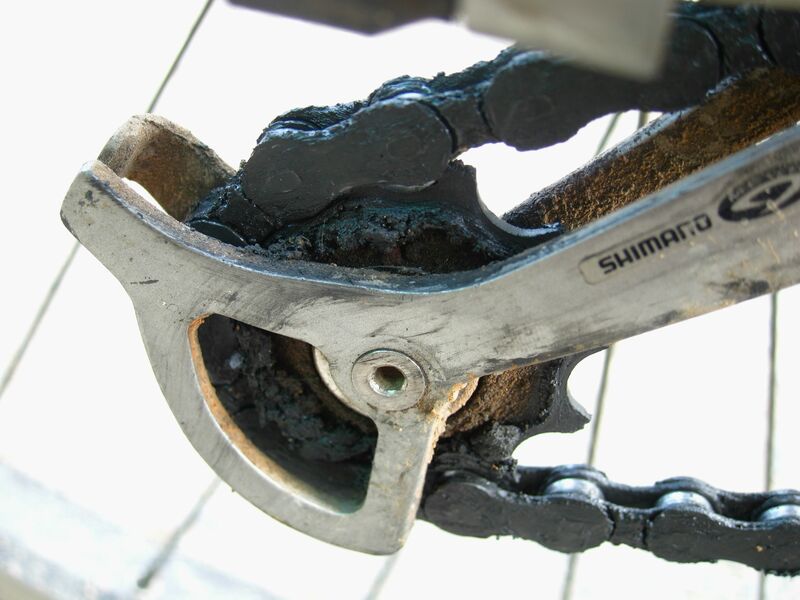 We were also reminded exactly why we like riding our bikes so much. 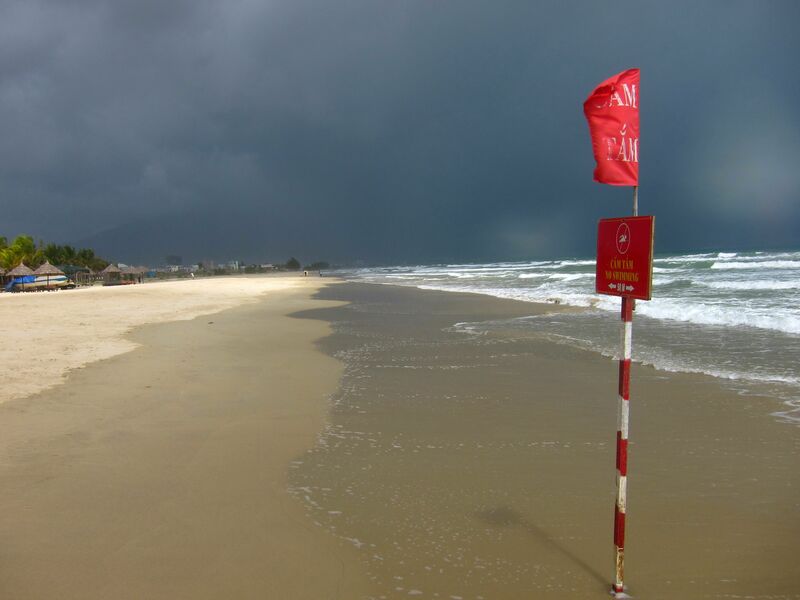 We hailed a taxi when we finally got to Da Nang and got a hotel near the beach. It was a ways out of town, but worth it because it was so quiet. 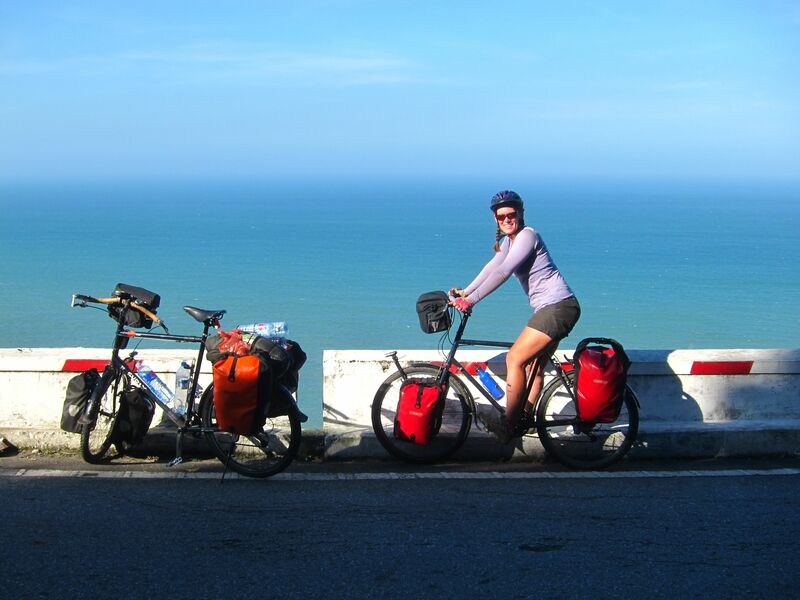 Once settled, Chandler received an email from our hotel in Nha Trang that our bikes were on a bus and we could get them at 6am the next morning from the bus depot! Awesome!